Professionally landscaped homes and public areas are transformed into spectacular showplaces at night...when illuminated with Professional Outdoor Landscape Lighting. Artful gardens, dramatic trees, enchanting water features—a new visual excitement is created at twilight with our fixtures. 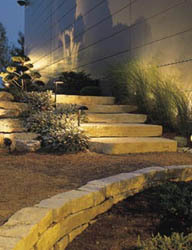 Landscape lighting enhances a property's value and pride of ownership. 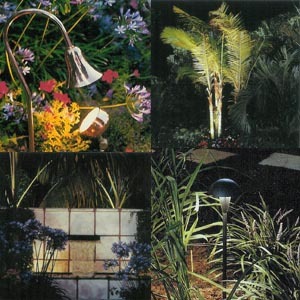 Outdoor lighting creates a new drama and beauty in a garden year-round. At Golden Rule Service Inc. we are pleased to offer one of the industry's most exciting and extensive collections of high-quality fixtures for all landscaped sites. This dramatic selection—with more than 100 fixture designs and finishes—will add beauty, style, and safety to public and private spaces. There are fixtures to match every architectural design and budget. Behind the aesthetic beauty of our fixtures are advanced electrical components that ensure reliable operation and totally automated lighting systems. A state-of-the-art system includes transformers with timers, photocells, motion detectors, and other remote-control devices. Copyright Golden Rule Service Inc.